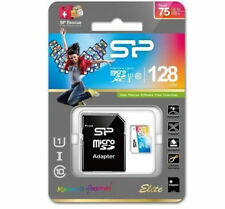 Elite UHS-1 micro SDHC series are available in 16 GB, 32 GB, 64 GB and 128GB. With the combination of the large. Capture high-quality images and extended lengths of stunning 1080p full-HD video with any micro. SDHC Class10 compliant, read speed is up to 40 MB/s (16GB/32GB). Card readers serve a number of purposes that SD and microSD cards can’t do alone. he Key Card Reader is a small, thin, lightweight tool with tons of capabilities. SDHC Class10 compliant, read speed is up to 40 MB/s (16GB/32GB). Card readers serve a number of purposes that SD and microSD cards can’t do alone. Transfer Convenience. he Key Card Reader is a small, thin, lightweight tool with tons of capabilities. Elite micro UHS-I flash card series complies to the SD Association's specifications. It is compatible with all types of digital devices that support SDHC, SDXC and 4K displaying as well as all kinds of DSLR camcorders. In compliance with SD Association specifications. The reading and writing speed of UHS-3 flash cards enchances to 90/80 MB per second, which brings outstanding storage and access efficiency for high quality images and more smooth photographic experience. The read and write speeds reach up to 85MB/s (8GB to 64GB) and 75MB/s (128GB) and provide outstanding storage and access efficiency. Elite micro UHS-I flash card series complies to the SD Association's specifications. If there's a problem, just let us know and we will fix it. X Ray proof. Security level complies with Secure Digital Music Initiative (SDMI). SDHC Class10 compliant, read speed is up to 40 MB/s (16GB/32GB). UHS-1 Class 10 specifications, enabling fast file transfer speeds and Full-HD video recording. it supports Full-HD video recording so that you can capture HD videos without annoying lags and dropouts. Hard Drive Size 32 GB. RAM Size 32 GB. 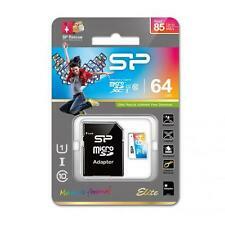 Series SP032GBSTH010V10-SP Micro SDHC Class 10. X Ray proof. Security level complies with Secure Digital Music Initiative (SDMI). 64GB Capacity, UHS-1 Class 10 Ultra high Speed. Fully upgrade to Ultra High Speed Class 1 specification (UHS-1). 32GB Capacity, UHS-1 Class 10 Ultra high Speed. Fully upgrade to Ultra High Speed Class 1 specification (UHS-1). Micro SDHC Class10 compliant. Supports Micro SDHC devices and cardreader. 16GB Capacity, Class 10 high Speed. Key Features. Security level complies with Secure Digital Music Initiative (SDMI). Class 10 High Speed. Capacity 32. Flash card type Micro Secure Digital. Note: If product contains EU standard plug, the UK plug adapter will be included! Storage temperature (T-T) -25 - 85. Technical information. 2GB Silicone Power MicroSD Memory Card. 2GB Silicone Power MicroSD Memory Card. Tested and formatted and ready to use. 603 Mobile: I have a number of other retro phones, smartphones, tablets, smartwatches and/or memory cards listed. alexb603 an eBay member since 2004. This item was listed using the eBay mobile app. X Ray proof. Security level complies with Secure Digital Music Initiative (SDMI). SDHC Class10 compliant, read speed is up to 40 MB/s (16GB/32GB). We're happy to help. We do not accept P.O. Boxes. New Arrivals. In compliance with SD Association specifications. Approved by the testing of shockproof, waterproof and x-rayproof. Also equipped with automatic error correction code (ECC) function, to ensure high stability and durability. SDHC Class10 compliant. Transfer rates may vary, depending on system platform / software / interface and microSD card capacity. adattatore SD. Lotto per 3 (tre) pezzi. (verificabile anche con h2testw). Silicon Power 32GB Class 10 MicroSDHC Card 85MB/s Adapter. 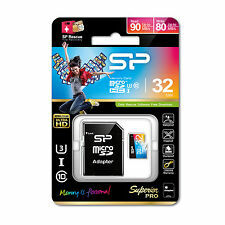 Title : MICRO SDHC 32GB. Label : Silicon Power. Manufacturer : Silicon Power. Publisher : Silicon Power. Studio : Silicon Power. Miniature Toy Model. For sale is this Silicon Power 4GB Micro SDHC Card. Class 4 Speed. Card has been tested, formatted and is in perfect working order. Photos are of actual item for sale and the one you will receive. 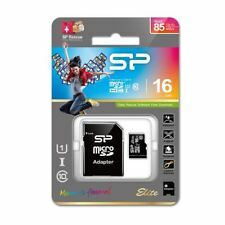 Silicon Power 128 GB Memory Card with SD Adapter, Elite MicroSDXC UHS-1 Cla... . The Silicon Power Elite UHS-1 micro SDHC series are available in 16 GB, 32 GB, 64 GB and 128GB. Fully upgrade to Ultra High Speed Class 1 specification (UHS-1). We are only happy if you are happy. Need help?. The Silicon Power Elite UHS-1 micro SDHC series are available in 16 GB, 32 GB, 64 GB and 128GB. Fully upgrade to Ultra High Speed Class 1 specification (UHS-1). Capture high-quality images and extended lengths of stunning 1080p full-HD video with any micro SDHC UHS-1 compatible devices.